Well, let's hope begging for mercy works. 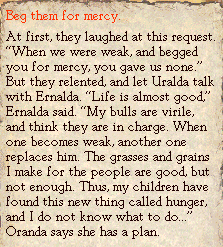 So Oranda heads back to her people, this time with some of Ernalda's two-legged bulls to protect her. 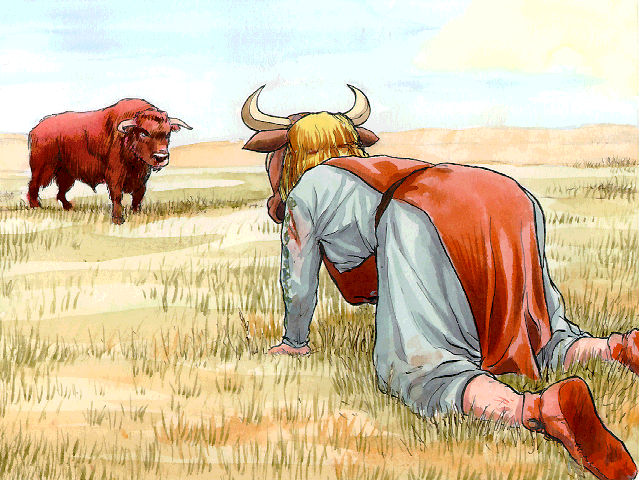 She tells her bulls to order the herd to get ready for a journey to the land of the two-legs. The bulls do not want to understand why this should be so. -Ignore the bulls. Bring the cows with you, and the bulls will follow. -"See my wounds? This is what the two-legs will protect us from." -"The two-legs will protect us from the biting things, and give us shelter." -"The two-legs will think that they rule us, but we will secretly rule them."